Bull Snake is a harmless snake and is named for its distinctive hiss, which sounds like a bull grunting.They are found in agricultural areas of the U.S., where they prey on rodents that destroy crops. They are whitish to pale brown with dark blotches and from 1.5 to 2.4 m (5 to 8 ft) long. Three types of bull snakes are the common bull snake of the central U.S., the western bull snake of the West Coast, and the pine snake of the East and Gulf coasts. Bull snakes are also sometimes called Gopher snake. 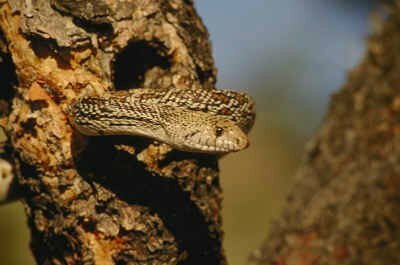 This entry was posted in Medical Tidbits and tagged Bull Snake by Manbir & Gurpreet. Bookmark the permalink.